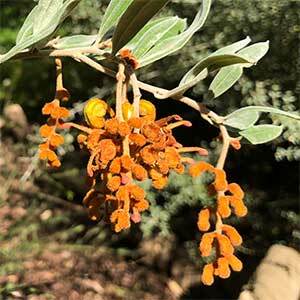 This is a rare species and Grevillea chrysophaea with its ochre yellow golden yellow it is also a threatened species. Found mainly in Gippsland Victoria it also appears in other areas, including to the west of Melbourne in the Brisbane Ranges. One form is a low bushy shrub, a second is taller and more open in growth habit. When in flower it attracts Honeyeaters and bees to the garden and the actual flowering period is from winter right through spring. This is not a species found widely in cultivation as propagation is difficult. It is best planted in a sheltered position, with good sun, a well drained soil is essential and a little afternoon shade in the height of summer is recommended. Propagation is usually from cuttings, also possible from seed which may need a smoke treatment to germinate. Position – Best in light shade or afternoon shade. Height – Variable from around .4 – 2 metres depending on form. Flowers – Golden Ochre or Golden yellow depending on form. Foliage – Mid green and very fine. Frost tolerant – Yes, moderate frosts.